With tree service Pensacola homeowners look to Totally Trees for fast and friendly service. We have been serving the Gulf Coast area for over the past decade. We offer a variety of tree services in the Pensacola and surrounding areas. Including Milton, Gulf Breeze, Cantonment, Pace, and Lillian. Tree Trimming – Power lines and over the house are no problem. Tree pruning to remove some dead branches that may fall or to create some shade can greatly improve the look of a property. Whatever that case, our tree care professionals can assist you with whatever tree services you may need. Why Choose Totally Trees in Pensacola? Simple. We enjoy what we do everyday. Not to mention most of us have been in the tree business since childhood. We maintenance all our equipment in house, ensuring that your job gets completed as quickly as possible, all while saving you money. We use top of the line equipment to get the job done. With recent storms, your property may be in need of tree removal or tree pruning. Pensacola has seen it’s share of the severe storms on the coast. Have your dangerous trees and branches removed with the help of the professionals at Totally Trees. Estimates are free. Get yours here or give us a call. We love a challenge. Where other tree removal companies have failed, we succeed. We have removed trees from houses, fences, cars, and other crazy areas. Most of the time these were failed tree removal attempt by either the homeowner or a inexperienced tree company. We also are asked quite often to assist other companies with their difficult removals. With the proper equipment, qualified field crews, and a safe tree service plan, Totally Trees can remove any tree safely and clean. 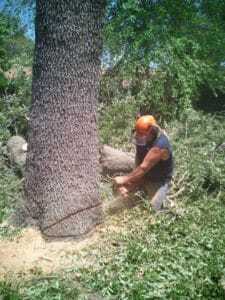 Our tree service Pensacola experts are ready, if your ready to get your property safe before the storms. Give us a call today or use the form below.